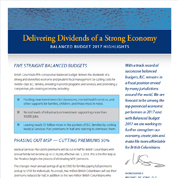 VICTORIA — British Columbia’s fifth-consecutive balanced budget delivers the dividends of a strong and diversified economy and prudent fiscal management by cutting costs for middle-class B.C. 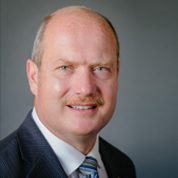 families, investing in priority programs and services, and promoting a competitive, job-creating economy, Finance Minister Michael de Jong announced today. Minister Michael de Jong answering questions from members of the media at the budget lockup, February 21st, 2017. Minister Michael de Jong talks to the news media and stakeholders at the budget lockup, February 21, 2017. Reader-friendly, plain-language overview of Budget 2017. 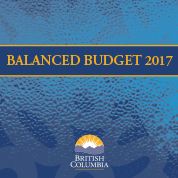 Budget News Release ( February 21, 2017 ): the budget overview distributed to news media. 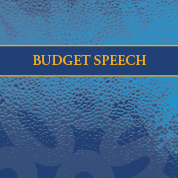 Budget Highlights: reader friendly, plain-language overview of the Budget 2017.